Natural Formulas. Organic Ingredients. Clinical Results. Free Shipping on Orders Over $75 + Free Samples with Every Order! 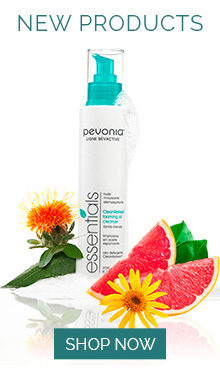 Pevonia was green before it was fashionable, launching in 1991 with cruelty-free formulas and post-consumer recyclable/reusable packaging. We incorporate delicately extracted phyto-organic and natural ingredients to create earth & skin friendly products that are mother-nature approved. Protecting the earth and maintaining an affinity with nature and its precious resources is an integral part of Pevonia's philosophy. Pevonia International is a member of the Organic Trade Association and holds a CTN Green Excellence Award. © 2019 Pevonia International. All Rights Reserved. eCommerce design and development by Digihaus.